California Gov. Jerry Brown has called the devastating wildfires tearing through Northern California "part of a trend — a new normal." But one climate scientists says "it's actually worse than that." "A new normal makes it sound like we've arrived in a new position and that's where we're going to be," said Michael Mann, a professor of atmospheric science and the director of the Earth System Science Center at Penn State University. "But if we continue to burn fossil fuels and put carbon pollution into the atmosphere, we are going to continue to warm the surface of the Earth. We're going to get worse and worse droughts and heat waves and superstorms and floods and wildfires." Mann added that "it's up to us" whether to do something about it. Speaking on PBS NewsHour, he said that if we reduce carbon emissions and move away from the burning of fossil fuels, we can prevent these changes from continuing to worsen. Carbon emissions are a primary driver of climate change, which amplifies the threat of wildfires by creating ideal settings for them to burn, explains Climate Nexus. Climate change is affecting conditions in both our summers and winters in ways that contribute to wildfires. "Dry periods become more extreme. 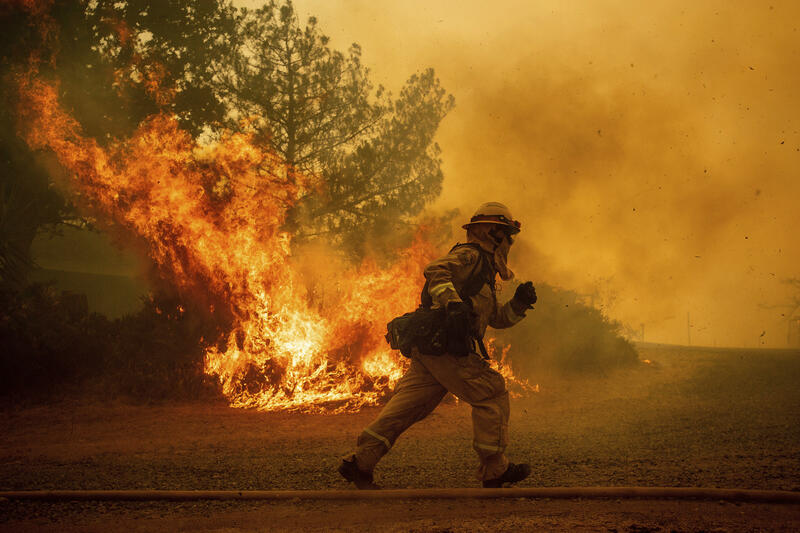 Wet periods become more extreme," LeRoy Westerling, a professor of management at the University of California, Merced, who has studied how climate affects wildfires, told CBS News last year. "Climate change is kind of turning up the dial on everything," he said. More precipitation in the winter means that more vegetation can grow in the spring. That vegetation can then dry out in the heat and fuel the flames if a blaze ignites. "Warmer temperatures and drier conditions increase the chances of a fire starting and encourage it to spread," says Climate Nexus, a communications group that focuses on climate change and clean energy. "These conditions also contribute to the spread of the mountain pine beetle and other insects that can weaken or kill trees, building up the fuels in a forest." As of Tuesday, large fires were burning across 14 U.S. states, where over 1.5 million acres have burned, according to the National Interagency Fire Center. In California, a pair of blazes known as the Mendocino Complex Fire grew this week into the largest wildfire in the state's history. Wildfires aren't the only extreme weather-related events seen in recent weeks. Heavy rains have inundated parts of the U.S. East Coast, and heat waves around the world have set multiple temperature records. A group of leading climate scientists warned in an article published this week in Proceedings of the National Academy of Sciences that the Earth is at risk of being driven into "hothouse" state from which it cannot recover. "Our study suggests that human-induced global warming of 2°C may trigger other Earth system processes, often called 'feedbacks', that can drive further warming — even if we stop emitting greenhouse gases," lead author Will Steffen, from the Australian National University and Stockholm Resilience Centre, said in a news release. Once that threshold is crossed, the "Hothouse Earth" would reach temperatures never seen in human history. The impact on human societies "would likely be massive, sometimes abrupt, and undoubtedly disruptive," the authors write. Mann, the Penn State climate scientist, said "we're walking out onto a minefield." "As we continue to move forward onto that minefield, as we continue to burn fossil fuels, we're likely to encounter more and more extreme and damaging and irreversible impacts on our climate," he said on PBS NewsHour. But he said it's not too late for changes to be made. "The only sensible thing to do is to stop walking forward on to that minefield," he said. "And we can do it. We can move away from the burning of fossil fuels. The Paris agreement has set a course for us that, if we follow, and if we improve on that agreement in the years ahead, we can prevent the worst impacts of climate change from occurring." Stefan Becket contributed to this report.